Touring the Paris Catacombs, the haunting resting place of more than 6 million French citizens is a truly unique experience. 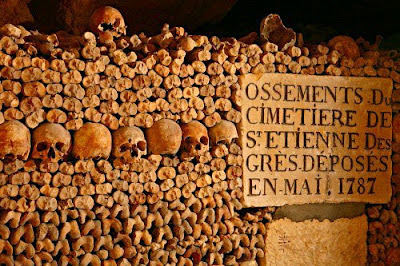 Our tour group sinks deep into the tunnels of Paris and covers over a kilometer of catacombs littered with human remains. Explore the disturbing and extraordinary history of the burial grounds while learning the chilling stories and legends of these galleries of skeletons. The Paris Catacombs were built as limestone quarries, which were mined for the building of some of Paris' most famous buildings and bridges. After the mid 1700s, the quarries were used to deal with Paris' overcrowded cemeteries, and millions of bodies were transfered from the cemeteries to the catacombs. In order to maximize the storage capacity of the quarries, the exhumed bodies were simply stacked on top of one another in different rooms in the Catacombs creating many miles of human-bone walls.